High quality protein supplement promoting optimal muscle development and bone growth in growing and mature horses. 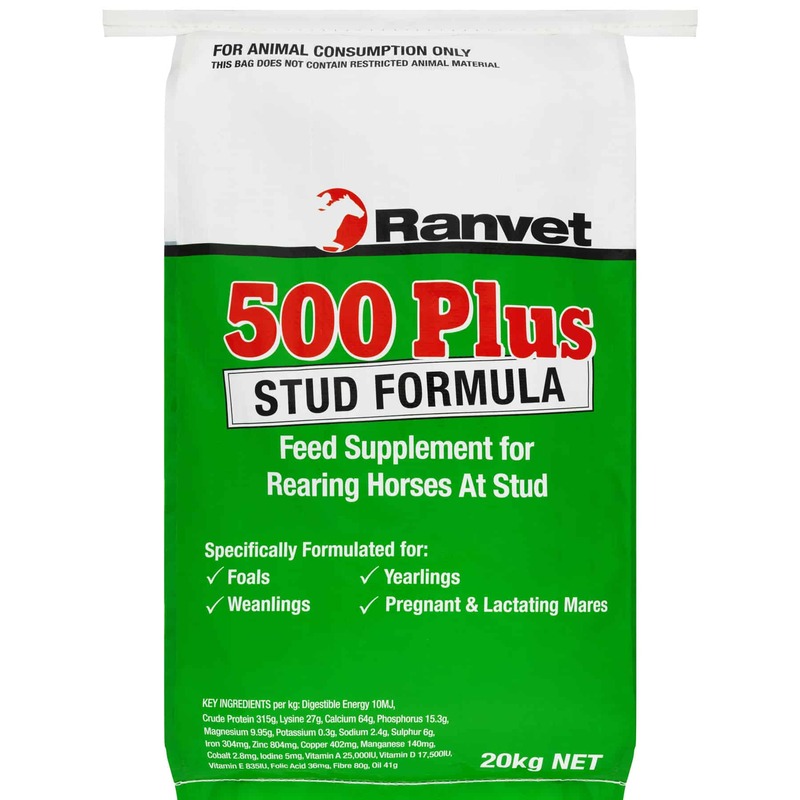 Daily supplementation of Ranvet 500 PLUS will provide balancing nutrients for sound growth and excellent conditioning. Supplies a unique amino acid profile which provides the building blocks to lay down bone and muscle in growing horses and keeps older horses looking young. Optimal calcium:phosphorus ratio to ensure sound bone growth and development. Provides correct balance of critical bone mineral nutrients, preventing demineralization through dietary imbalances. Essential elements for normal bone metabolism. Essential co-factors in calcium absorption and metabolism. Recently re-formulated in line with the latest research which suggests that increasing the levels of key minerals may reduce the incidence of developmental orthopaedic disease-enhanced levels of phosphorus, copper and zinc. Vitamin E now added in response to dry conditions and additionally, to enhance the immune response. 300-600g daily addition to the ration. Ideally, pellets should be divided equally between morning and evening feeds. To ensure the transition from growth and development to competition occurs smoothly, it is recommended that Ranvet’s Power Formula or Topline FX be fed following all Ranvet 500/PLUS feeding regimens.